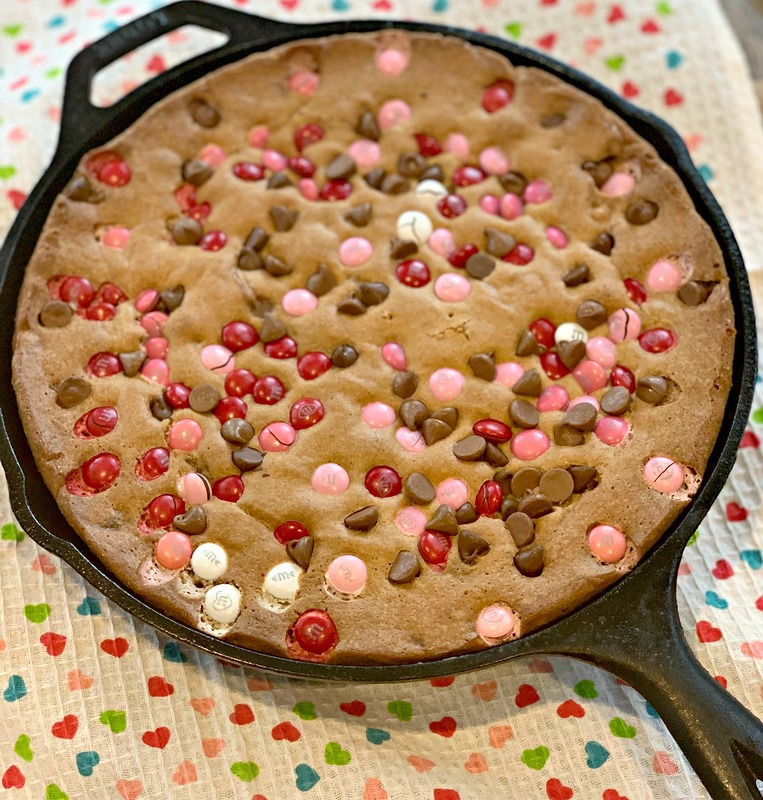 This Valentine’s Day Chocolate Chip Skillet Cookie is just the thing to make for your Valentine! A moist, flavorful cookie loaded with m & m’s and chocolate chips! I don’t know about you, but I LOVE baking Holiday themed sweet treats! My kids get so excited when Holidays roll around, whether big like Christmas, or small like Valentine’s Day! 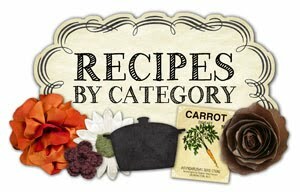 I’ve made it a tradition in my house to roll out a new sweet treat to celebrate each occasion! Last week, I was at my local grocery store browsing the Valentine’s Day candy. Dangerous, I know! I saw the Valentine’s colored M & M’s and knew I had to grab a bag! Deciding to keep it simple, I decided to make M & M chocolate chip cookies. 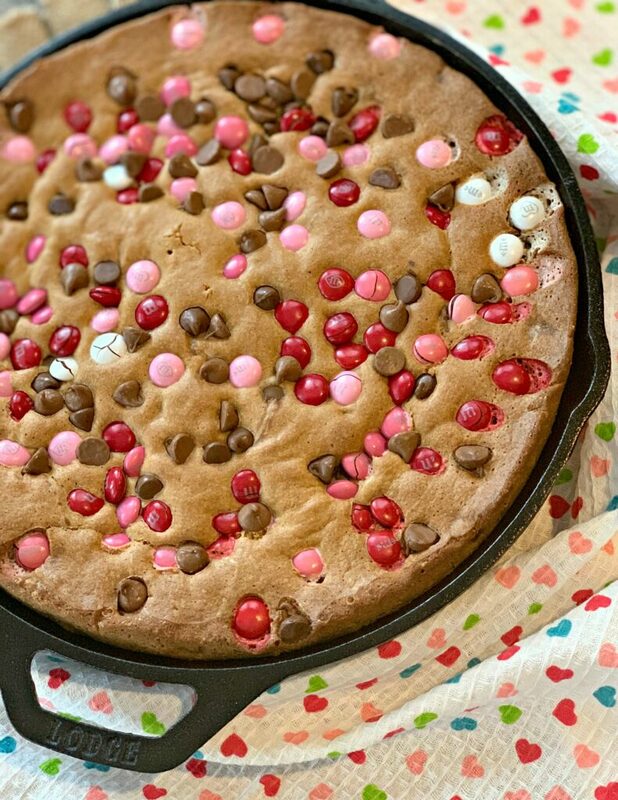 However, wanting to change it up, I opted to make the cookie into a cookie pie, and bake it in a skillet! As soon as my kids came home from school, they walked in the door and immediately asked what I had baked. The house smelled like cookie, so they were immediately alerted to dessert awaiting them! Their eyes lit up when they saw it was in the skillet! After dinner, my hubby cut everyone slices and it was gone in no time! We all thoroughly enjoyed it! The cookie itself was moist, flavorful, and packed with just the right amount of chocolate chips and M & M’s. I had cut down on the sugar a bit so it wasn’t overly sweet! We cut ours into small pie like slices and my boys placed a scoop of vanilla ice cream on top to make a cookie sundae! Enjoy! *You can adapt to any Holiday by using different colored M & M’s! I used a 10 inch skillet, but 12 inch works great as well! Be sure to sign up for my newsletter below by entering your email! 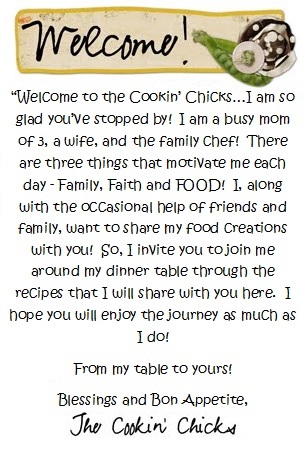 You’ll receive my latest recipes sent directly to your inbox, plus receive exclusive newsletter only recipes, giveaways, and more! 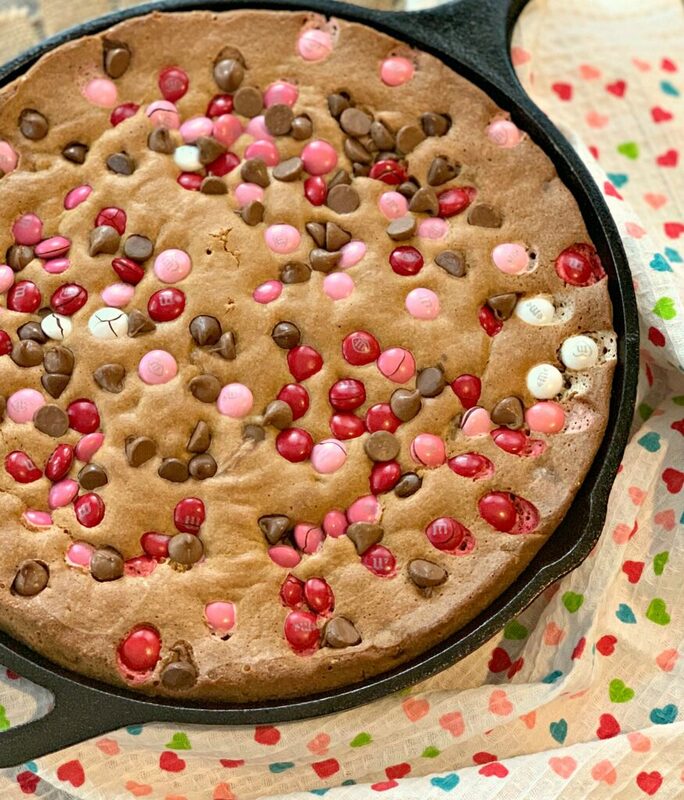 This Valentine's Day Chocolate Chip Skillet Cookie is just the thing to make for your Valentine! 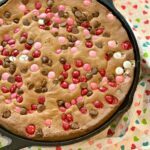 A moist, flavorful cookie loaded with m & m's and chocolate chips! Place butter into skillet and place skillet into oven. Once butter has melted, remove pan from oven and pour butter into medium sized mixing bowl. Add the brown sugar and vanilla extract. Stir to incorporate. Add the flour, baking soda, and salt. Once combined, fold in the chocolate chips. 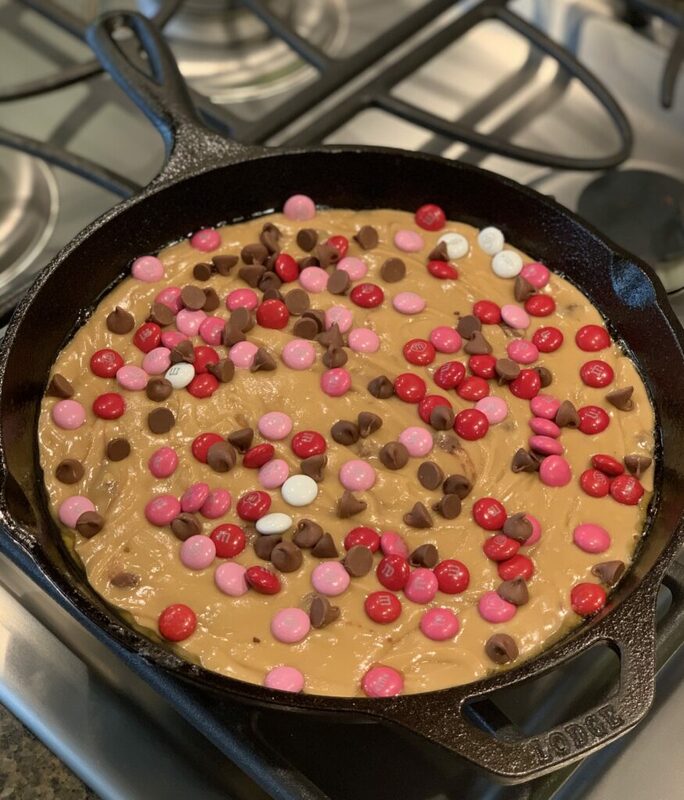 Place cookie dough into skillet and spread evenly. Remove from oven once toothpick comes out clean when inserted in center.